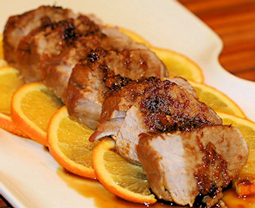 Pork Tenderloin in Orange Caramel Agave Sauce - A recipe from Savor California, the online showcase for extraordinary gourmet foods and beverages from California. Combine all of the ingredients except the pork loin in a skillet over medium heat and stir until the 21 Missions caramel agave sauce thickens. Add the pork loin to the same skillet with the thickened caramel agave sauce. Turn the pork loin frequently and baste continuously with the caramel agave sauce. Cook for about 30 minutes until the pork loin is tender and cooked through. When the pork loin is well glazed remove the pork loin from the skillet and rest the pork loin for a few minutes before slicing. Place the sliced pork loin onto a serving platter and drizzle with the thick and delicious caramel agave sauce. Serve with a crisp salad or lightly cooked snow peas or sugar snap peas. Adapted from Caramel, 2006, by Trish Deseine, Marie-Pierre Morel.